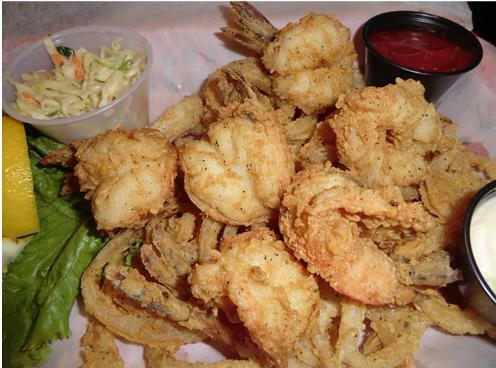 Cajun catfish, spicy shrimp, and fresh lobster — there is nothing like quality seafood to get the mouth watering. Any food lover is on a quest for the best in seafood, and we can deliver. Here at Crazy Alan’s Swamp Shack, we take the yummiest saltwater catches and land them right on your plate. Our extensive seafood menu offers unique options and delicious variety. As soon as you walk into either of our Texas locations, you will be surrounded by the sights of the swamp. From our rustic wooden finishes to the lifelike fish dangling from the ceiling, our hungry customers will feel right at home. And once you are greeted by our friendly and welcoming staff, you will become part of the Crazy Alan’s family in no time at all. Our atmosphere is family-friendly and fun, and our Kemah cajun restaurant offers live music during the evenings and weekends. 7 days a week March through August. You can sip on a cold beer, bite into your cajun shrimp, and relax to the rhythms of The South. And for those who are more in the mood to kick back at home with their spicy catfish, we offer a takeout option. If this live music and delicious food continues to be enticing for you, we hope that you choose to join our Birthday Club. Here at Crazy Alan’s, we cherish our customers, so we want to give back in any way we can. By giving you free food, we thank you for being part of our family. After all, you are the reason why we can make such delicious food every day. The chefs at Crazy Alan’s put their heart and soul into making delicious, fresh caught seafood for you, and we believe we are serving cajun seafood the right way. Since we hold ourselves to the highest standards, we hope that your experience will reflect our commitment. We hope to meet you soon at our Baybrook or Kemah locations. We’ll try and save some cajun catfish and spicy shrimp just for you. Absolutely amazing each and every time! We have been enjoying the crawfish here for the past few seasons. Even when they have been smaller (as they obviously fluctuate in size due to the time of the season) they have always been seasoned well and taste perfect. We are sad that the season will be ending soon but will be visiting during the off season as well! Our waiter Ricky Sherman was awesome , always on top of everything and made coming here the best , food was all perfect and music great as well ....Great waiter, great food and music. Absolutely delicious my husband and I came here to Kemah for the weekend to celebrate our anniversary. We ate here the first night and had to come back the second night because we couldn't resist it. Super fast service amazing food they know what they're doing I couldn't recommend anything better and their Gator is to die for. Really enjoyed the food and service. Wife and daughter enjoyed the gator burger and I had the blue cat plate. We ate outside because it was a cool day and really had a good time listening to the live music. My fiance and I went yesterday for dinner and had the all you can eat catfish and shrimp, it was delish! Service was very good, and I really liked the atmosphere and enjoyed myself. Thank you swamp shack! Very good boudain balls, gumbo and my hubby really enjoyed oysters and October beer fest! Will be back! Our family loves Crazy Alan's Swamp Shack. Food was great and our waiter, Emanuel was awesome!